Manteca is located off of Highway 99 - between Stockon to the North and Modesto to the South. From Manteca take Highway 120 for 111 miles until you reach Tuolumne Meadows inside Yosemite National Park. Day use parking is available at various locations off Highway 120 in Tuolumne Meadows, and overnight camping is also available at the Tuolumne Meadows Campground. This trip is a welcome reminder that great tresure lies buried directly underneath your feet. Like right where you are standing - yes, there. I've been a former seasonal park ranger and devoted fan of Yosemite National Park going back some 25 years. For that entire span of time, I've driven over, hiked around, fished above and fished below this one stretch of water. But, never actually wetted a fly-line here. 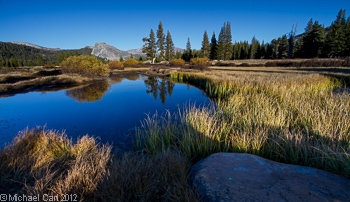 I'm talking about the Tuolumne River as it flows through its namesake meadow. How did I get blinded? I needed a Captain Obvious moment here. So I did what the Captain would do - I parked just off Highway 120 in the heart of Tuolumne Meadows and walker the 50 yards or so to the wild river. What do you get for a five-star ease-of-access? 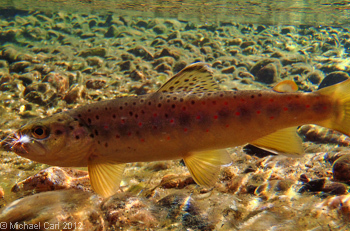 Zero fishing pressure and some of the wiliest brook and brown you'll have the fortune to fish to. These fish reside at about 9000 feet and know a thing about survival. Conservation of energy is somewhere in their DNA strand. I saw it in practice on an early fall trip this year. 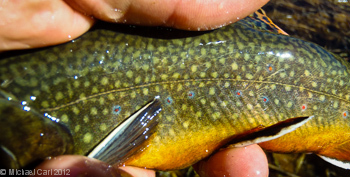 As fly anglers, it's drilled into our heads to drift flies into feeding lanes. Usually such a lane is a current seam or where a piece of structure breaks the current. You might as well throw those ideas out your tent window on this 9000 foot high run of water. First off, unlike those streams you fish with aquatic insects, the Tuolumne River here lacks these bugs for the most part. Second, even for a trout to hold in a typical feeding lane requires energy. Energy wich is more expensive than gasoline at $5 a gallon. The lesson for me, at least, look for slow water. Even back water that forms away from the main channel. Here is where I found brook trout on the Tuolumne. And yes, it's easy to tune out old Captain Obvious. But sometimes it's in clear and plain sight, and we just don't see it.